VirtualChaos – Nadeem's blog | I thought what I'd do was, I'd pretend I was one of those deaf mutes … or should I? I’ve published a post on engineering.talis.com entitled Puppet development workflow with Git. I have an S3 bucket that contains several hundred files in a folder. I needed to copy those files into a different folder in another bucket. Sounds simple enough? but was unable to find a simple way to do this through the AWS Console. I found a number of stack overflow articles that talked about using Sync, or downloading the files and re-uploading them. None of which sounded particularly appealing. This just uses s3cmd to list all the files in the bucket/folder I wish to copy from. The output of that is piped to awk which I use to extract the s3 url of each file. I then use tail to remove the first line which I don’t need. I then use sed to build up a ‘s3cmd cp’ command which copies the file from its original location to my new location. If anyone can suggest a better way that doesnt require me having to download the source files … I’d love to hear it. If you can’t see the embedded Gist above then you can view it here. because as we migrate lethal decision-making from humans to software, we risk not only taking the humanity out of war, but also changing our social landscape entirely, far from the battlefield. That’s because the way humans resolve conflict shapes our social landscape … Now if responsibility and transparency are two of the cornerstones of representative government, autonomous robotic weapons could undermine both … And this is why we need an international treaty on robotic weapons, and in particular a global ban on the development and deployment of killer robots. Now we already have international treaties on nuclear and biological weapons, and, while imperfect, these have largely worked. But robotic weapons might be every bit as dangerous, because they will almost certainly be used, and they would also be corrosive to our democratic institutions. I’ve been reading a lot over the last few months, and whilst I wish I had the time to write a fuller review of each of the following, I know I just wont have the time. Therefore I’ve written a short review for each of these titles. 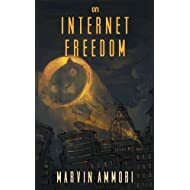 Marvin Ammori is a leading campaigner and legal expert on net neutrality and keeping the internet free. This is an excellent book – and it brings together a set of stories that underline why the Internet changes not only how we think about free speech, but how we must seek to protect and promote it. The message is a simple one – that the Internet has come to be the most important engine of free expression in history. Yet it could also be broken due to the missuse of government and corporate power – motivated by fear, greed, and misguided notions of responsibility. This book does succeed in providing some hope that the spirit of activism on the Net is mobilising people to defend their rights.This book was written against the backdrop of SOPA and was therefore very timely. I’ve always admired Christopher Hitchens, and over the years have read many of his articles and books. He was never one to shy away from making a principled argument. It comes as no surprise that one of the most remarkable polemicists this country has ever produced didn’t leave without having a few important things to say. 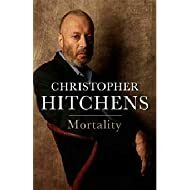 It is a sobering and often harrowing account of Hitchens final “year of living dyingly” as describes his battle with Cancer in seven essays. The essays begin with Hitchens being diagnosed in June 2010. The openness with which he relates the news is, I think, brave, and his shock is palpable. But I think what I admired the most was rather succumb to rage he instead favours Curiosity. The cancer robbed him of his two main attributes: his voice and the energy to write and its his reflections on these two aspects of his illness that are the most poignant. 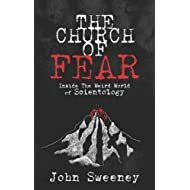 It is as if there is in the United States an eleventh commandment: “Thou shalt not criticize another man’s religion” The danger is that in America they are so afraid of religious un-freedom that they fear to discriminate between a religion and a confidence trick. I’ve never read any of the other books in the “How they started” series. However this one was recommended to me by a friend, and it was well worth reading. The book profiles a wide variety of businesses most you will have heard of. 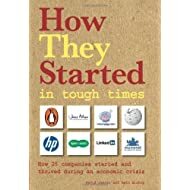 Many insights are given into just how these businesses got started and survived in hard economic times. Given the current economic climate, I found the book actually offers hope rather than the typical doom and gloom. The particular companies that are profiled include Wikipedia, Moonpig, Mumsnet, LinkedIn, Walt Disney, Penguin and many more. Pretty inspirational actually. 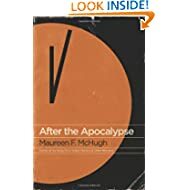 I love reading science fiction and fantasy, this was a wonderful collection of short stories that are about life after an Apocalypse. Any large enough catastrophe is an apocalypse of sorts, leaving lives altered in its wake, with survivors who still need to live in a changed world. What I really liked about this collection is that those survivors are simply everyday people caught up in events, and the choices they make are as varied as human beings can be. With “near-future” being one of the hot topics in science fiction at the moment After the Apocalypse succeeds where others don’t by depicting ordinary people trying to get on with their ordinary lives as best they can, despite the hopelessness and horror around them. Act, -act in the living Present! I’ve been working more and more with nodejs and have to say I am really loving how easy it’s been to get to grips with. I’ll be posting up more about how I’m using node and the problems I’m using it to solve over the coming weeks. However I wanted to illustrate just how simple it is do something that would be more work in other languages such as PHP. So here’s a quick example I created that illustrates how to make a simple JSONP call to a nodejs + express server. 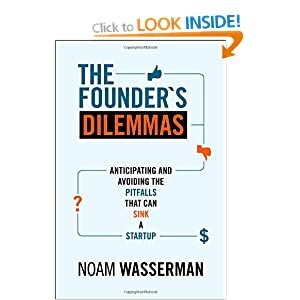 I’ve really enjoyed reading Noam Wasserman’s ‘The Founders Dilemma: Anticipating and Avoiding the Pitfalls That Can Sink a Startup‘. This is possibly best described as book of research and case studies conducted into starting up a company from the perspective of an entrepreneur. Wasserman focuses on the key dilemmas any founder of a startup will face; these include career dilemmas, dilemmas with co-founders, acquisitions, investor dilemmas, recruitment, exit dilemmas and many others. The book analyses, quantitatively, the early decisions by entrepreneurs that can make or break a startup; what he has done here is conducted real research to get beyond anecdotes and case studies to more general patterns. What occurred to me was that many of these dilemmas apply to any situation where a leader might be faced with building a team, finding the right people to embark on a journey together in order to achieve a shared goal. What makes this book such compelling reading are the real world examples that Wasserman cites, and the candor with which he analyses the decisions that were made and describes the real effects and consequences of those decisions. Quite excited, learned recently that Takashi Miike‘s, Hara-Kiri: Death of a Samurai, will be available here in the UK fairly soon. 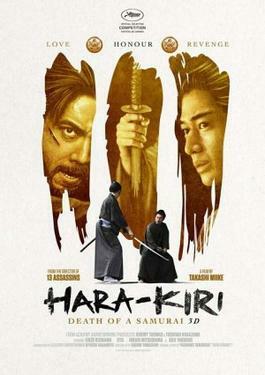 Right now all I know is that it’s an adaptation of Masaki Kobayashi‘s 1962 film Harakiri, which is one of my all time favourites. The original film is set in 17th-century Japan, where an era of peace causes the Shogunate to breakup the various warrior clans, throwing thousands of samurai out of work and into poverty. Such a fate is abhorrent to a Samurai, and many prefer ritual suicide (hara kiri) than to live their lives destitute. The film tells the story of an old warrior, Hanshiro Tsugumo (Tatsuya Nakadai), who arrives seeking admittance to the house of a feudal lord in order to commit ritual suicide. The reason behind Hanshiro’ arrival is far more complex, as his real motive is to exact revenge against the house. Whilst preparing to commit the act, Hanshiro recounts, in flashback, to the various assembled members of the house, the tragic story of his son-in-law who was forced to sell his real sword to support his sick wife and child. The story comes to a head when it is revealed his son in law was forced to commit ritual suicide with a dull bamboo blade when he came to the same house seeking work. The original film was brilliant, and I’m really excited to see how Miike has re-imagined the story. There’s a trailer here.